All New! 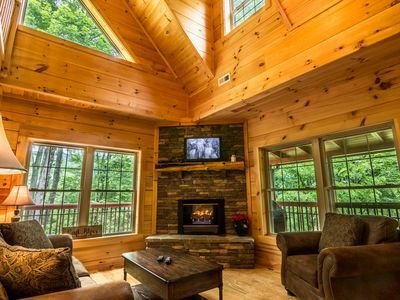 The Woods Retreat is a cozy rustic mountain condo in an amazing location with a wood burning fireplace, resort heated pool, 2 hot tubs & Free shuttle to the the Slopes! 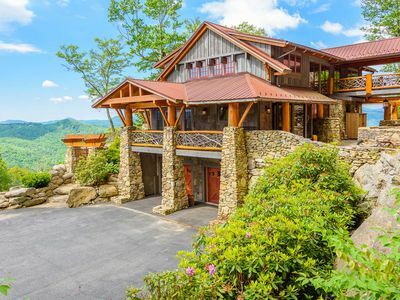 This perfect getaway is nestled in the heart of Beech Mountain 5506 feet up in the clouds. 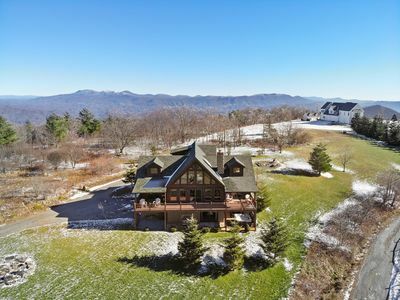 Offering you a relaxing retreat to enjoy wineries, sit by the fire and explore the many views or an action packed time on the slopes mtn biking, skiing/boarding, hiking & much more! You will want to come back time & time again! 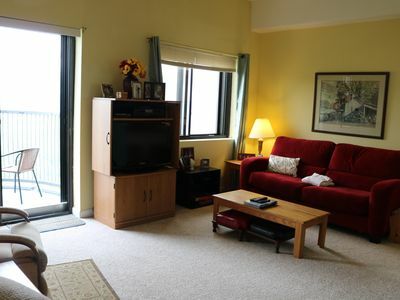 Our top 3rd floor condo features uninterrupted mountain views from the inside and out. 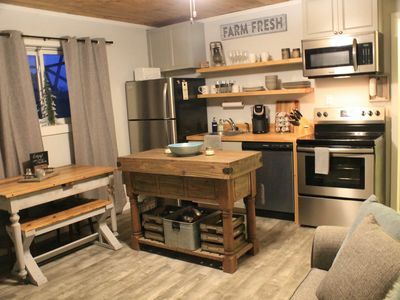 Perfect for couples, a group of 4 or a small family our cozy "chip and Joanna" rustic decor is newly updated for a perfect getaway! 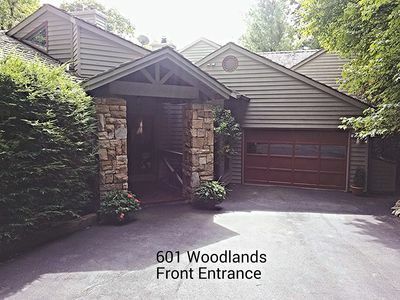 Enjoy the wood burning fireplace, open plan kitchen/dining with all new full-size stainless appliances. 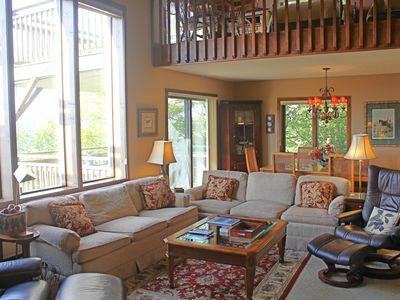 Ample comfortable custom seating that can be wheeled in front of the fire for game night or homemade meals. 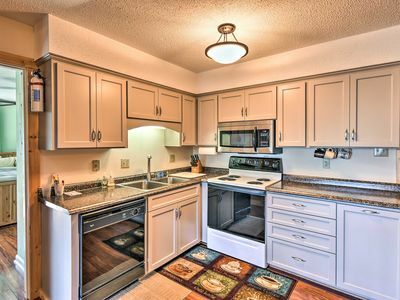 There is a full bathroom, balcony, and an in unit washer/dryer. The Master bedroom has a queen size bed and the living room has a queen size sleeper sofa, both are new top of the line cooling memory gel mattresses that feel like you are sleeping on a cloud! Enjoy your morning cup of coffee or evening hot chocolate/ or hot cider from our Keurig we supply a variety for you to enjoy! 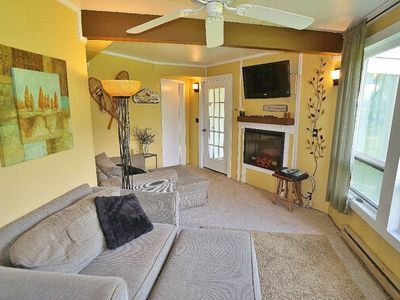 There is unlimited Wi-Fi, 2 TVs with full cable line up, amazon & streaming. There is a blue tooth sound bar in the living room as well. Our hope for you is to have an amazing holiday and fall in love with this area as we have. 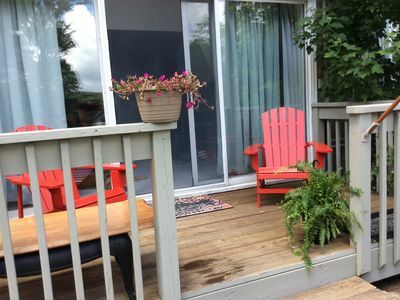 We believe that when you are here this is your home for however long you are staying and our hope is that you will be relaxed, comfortable and happy. 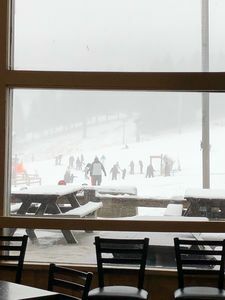 Welcome to our piece of the mountain! 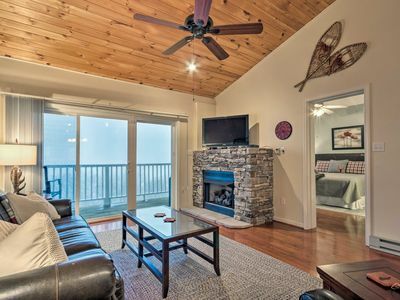 During your stay you will have full access to the resorts indoor heated pool, 2 hot tubs, 2 saunas (one dry one steam)(**April 2019 ONLY: The pool, All Seasons and Hot Tubs will be closed for a couple weeks for repainting and a new pool heater**), small weight room, pool table, shuffleboard, mini golf, tennis courts, clubhouse for small events, basketball court, onsite parking and a FREE shuttle to Beach mountain ski resort. 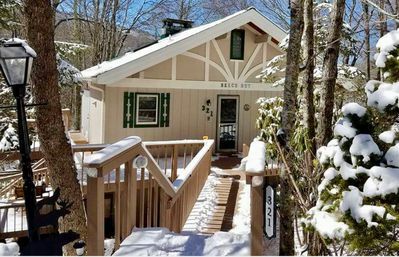 Wood's Retreat is conveniently located less than 2 miles from Beech ski resort ski resort, minutes (even a walk in the warmer months) to the mountains 9 restaurants, and shops like Freds Mercantile General store for essentials and firewood! 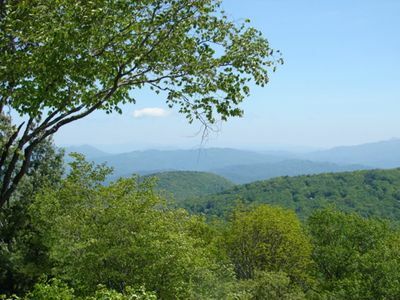 We are just a few miles from The Land of OZ , Off the Grid Mountain Adventures and downtown Banner Elk. 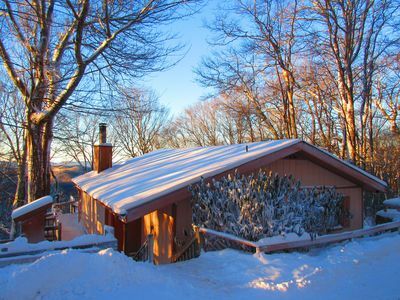 A short drive will lead you to Grandfather mountain, Apple Hill Farm (the inspiration for our quirky bathroom! ), the original Mast General store, Tweetsie Railroad, Linville Gorge/Falls and Caverns and much more! We are approximately 2 hours from Charlotte and Asheville. 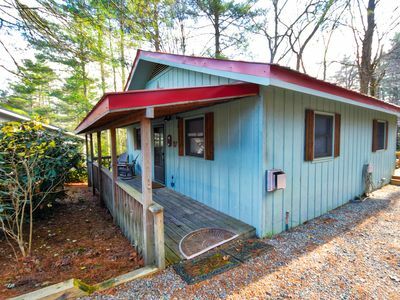 We are approximately 25-30 minutes from Boone, Blowing Rock, and the Northeastern Tennessee border. 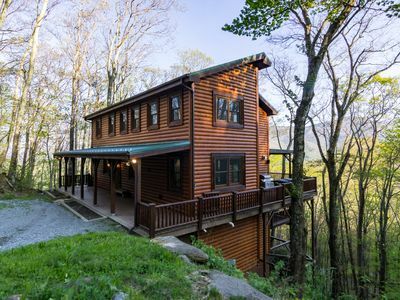 Sugar Mountain House 3 Bedrooms 3 Bathrooms, Amazing 80-Mile Views ! 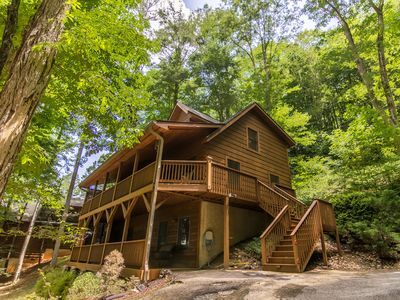 Deer Run - Hot tub, pet friendly, wooded, lots of privacy! 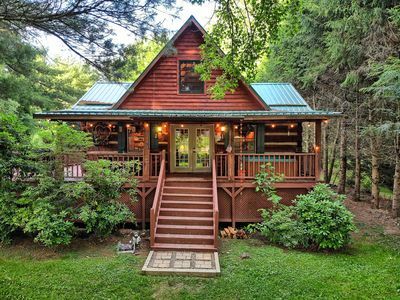 Cozy cabin on the river in Millridge with swimming pool and tennis courts ! 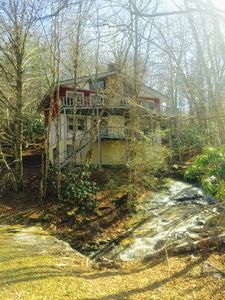 A Riversound - Valle Crucis Cabin with Large hot tub, Pool, Poker table, walk to river! 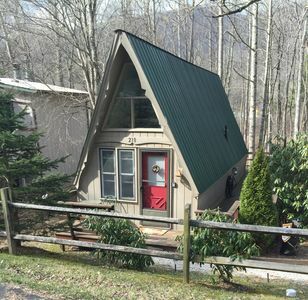 Cozy Condo - Walk to Resort, 9 Miles to Sugar Mtn!